Things are heating up down in South America, and it’s not just the weather. Across the continent, the crowds are awakening and the peoples’ creativity is being unleashed. Thanks to the first generation of crowdfunding platforms, everyday citizens across the region are sparking a new generation of cultural and social innovation – and it’s only the beginning. In this blog, we are going to follow up on My CFS (My Crowdfunding Study) and look at how crowdfunding is expanding in Latin America. Back in January and February of this year, Joel saddled up his backpack and headed down to South America to conduct an unofficial study on crowdfunding. Over the course of the six-week journey, he travelled through major cities in Argentina and Brazil and spoke with locals both inside and outside the crowdfunding scene in order to better understand the movement. The conclusion (read the final report) was that crowdfunding is the perfect tool for the Latin cultures, where a collective focus and community mentality come naturally, to kickstart the creative economy. Since that time, there have been a few big moves in the ecosystem, several amazing projects realized and a growing realization that crowdfunding in Latin America is going to play a huge part in shaping the region’s future. 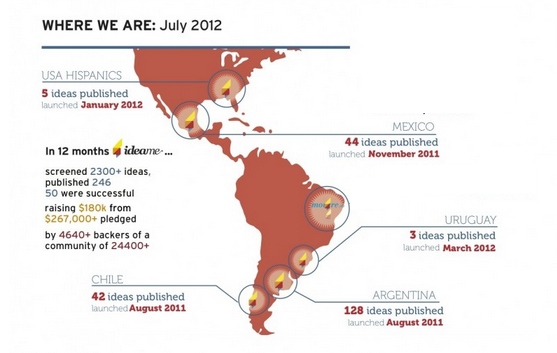 Launched in August of 2011, Idea.me was launched in Buenos Aires, Argentina by a team of (approximately) eight people. With the backing of investors, the platform initially launched in Argentina, Chile, and Mexico, before spreading into neighboring Latin countries (see graph below). Joel spoke with Pia Guidice, Director of Marketing and Communications (at the time of the interview), along with the company’s CEO and CTO, to understand the challenges that the platform faced at the early stage. In it’s first year, the platform raised $180,000 on 50 successful projects. In March, the company brought in a new CEO from Endeavor, a non-profit organization who focuses on impact entrepreneurship in emerging economies. Then in August, the company made a big splash by acquiring Brazil’s second biggest crowdfunding platform, Movere, in exchange for a 15% equity swap (the company has raised two rounds for a total of approximately $1 million USD). Idea.me continues to expand as they endeavor to become THE crowdfunding platform in Latin America. Catarse, which means ‘catharsis’ in Portuguese, was launched in January 2011 in São Paulo, Brazil by two Brazilian business students and a developer from Southern Brazil. The trio bootstrapped the idea, merged with another group in Rio de Janeiro, and continued to grow organically throughout 2011. The Catarse team reached the $1 million Reais mark (app. $600,000 USD) in November of 2011. Joel chatted with Luis Ottavio Ribeiro, one of the original cofounders of the company, who spoke about what was driving Catarse’s success and how it was different from North American sites like Kickstarter. 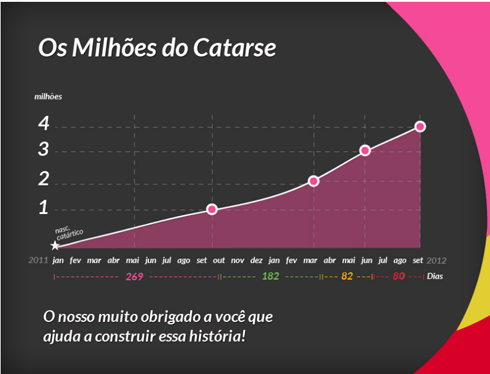 Catarse has increased their growth exponentially in 2012, recently eclipsing the $4 million Reais mark (see graph above). The company, who pledges to reinvest 100% of its profits back into the platform, has continued to grow itself organically and build its team and partners within Brazil. Their open-source strategy and bottom-up mentality have helped them to emerge as one of the most successful crowdfunding platforms in the world as far as project quality is concerned. The platform has grown its project and user base without sacrificing quality, and developed a stronghold on the Brazilian market that will be hard to crack. Impulso was originally built to be a micro-credit platform off of the Kiva model, which was not yet legalized in Brazil at the time of the study (not sure of the current status). It was developed by Aliança Empreendedor, a non-profit organization based in Curitiba, Brazil that works with entrepreneurs in low-income communities to stimulate the economic development in Brazil’s poorest communities. The organization, which has about 50 employees, has spun out several successful initiatives, including Solidarium, a social enterprise in Brazil that develops channels to global markets for the products of Brazil’s poorest artisans. Joel accompanied Aliança’s Marketing team on a field trip to the countryside to speak with two micro-entrepreneurs who had successfully raised funds on the Impulso micro-credit platform. He saw first hand the impact that a platform like Impulso can have, and spoke with organization’s founder, Lina Useche, to learn about how they planned to scale that impact in the future. Aliança relaunched Impulso as a crowdfunding platform in June of this year. The first project was crowdfunded in September. Even if you don’t speak Portuguese, you can probably see the energy in the faces of Aliança’s team and the micro-entrepreneurs they support in the launch video (embedded above). The Impulso platform gives Aliança a chance to scale its impact and help bring crowdfunding to the communities who need it most. The biggest issue in Latin America for crowdfunding relates to payments. As of yet, we have not seen any companies or organizations develop a strategy or innovate the payment mechanism to get over this hurdle, but we believe it can’t be too far off. In the favelas of Brazil, for example, laptops are uncommon but all the youth have mobile phones, a possible building block for a payment solution. To reach the poorest countries (ex. Boliva) and communities in Latin America, a new solution will have to developed, and it may even be a low-tech solution like M-Pesa in Kenya (see post Businesses with Bang! M-Pesa). Despite the fact Idea.me is working to be the big player in the Latin American ecosystem, the real movement may come in the smaller, locally-focused platforms. Catarse, on the other hand, continues to develop its presence in the cities and communities it knows best. It remains to be seen whether the best strategy is to expand out (globally) or to build in (locally). Banner Bag – Idea.me – out of Mexico comes the simple idea to use the mountains of political banners from the Presidential election, held in July, to create something useful. The Banner Bag team raised the financing to be able recycle the material from the signs and create 500 backpacks for low-income school children. Love the creativity coming out of Mexico! DREAM:IN – Catarse – DREAM:IN was a collaborative effort to help cultivate the dreams and inspirations of the average Brazilian citizen to identify new opportunities in business and public policy for Brazil. The group raised $60,000 Reias from almost 200 people, and used the money to develop the platform and hold a three-day conference, which included Catarse’s own Luis, to bring together Brazilian leaders to discuss the results of the project. The ultimate goal was to generate 100 new entrepreneurial opportunities for the Brazilian society – what an incredible project! Overall, crowdfunding in Latin America is more than just another market opportunity, it’s the catalyst for a whole new era of creativity and entrepreneurship. While it is starting to take off on its own, we think it will have to wait for crowdinvestment to become legalized (probably a couple of years away) in countries like Brazil before the real fireworks can be set off. In the meantime, crowdfunding platforms like Idea.me and Catarse will help provide the world with a glimpse of future of the creative economy in Latin America.